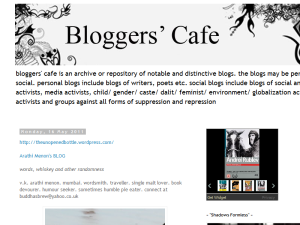 "Bloggers' Cafe" is an Archive or Repository of notable and distinctive BLOGS. The Blogs may be "Personal" or "Social". PERSONAL BLOGS include Blogs of Writers, Poets, Translators or "musings" of a Person on numerous and various "subjects". SOCIAL BLOGS include Blogs of "Social Activists", Political Activists, Environmental Activists, Dalit & Caste Activists, Activists and Groups against all forms of Suppression & Repression etc. This what your Bloggers' Cafe Blog Ad will look like to visitors! Of course you will want to use keywords and ad targeting to get the most out of your ad campaign! So purchase an ad space today before there all gone! If you are the owner of Bloggers' Cafe, or someone who enjoys this blog why not upgrade it to a Featured Listing or Permanent Listing?